This article was originally published in the February, 2019 issue of the Shout NZ. We are smack dab in the middle of summer here in New Zealand and boy has it been a scorcher. The holidays are now behind us, the water tanks are low and, as I type this, I can see a cloud of dust following my neighbor as he circles his lawn on the mower, the dry, rain-deprived soil kicking-up behind him. It’s enough to make you want to crack open a beer. But of course this begs the question: what beer can best contend with these sweltering summer days, while still satisfying our craving for flavour? 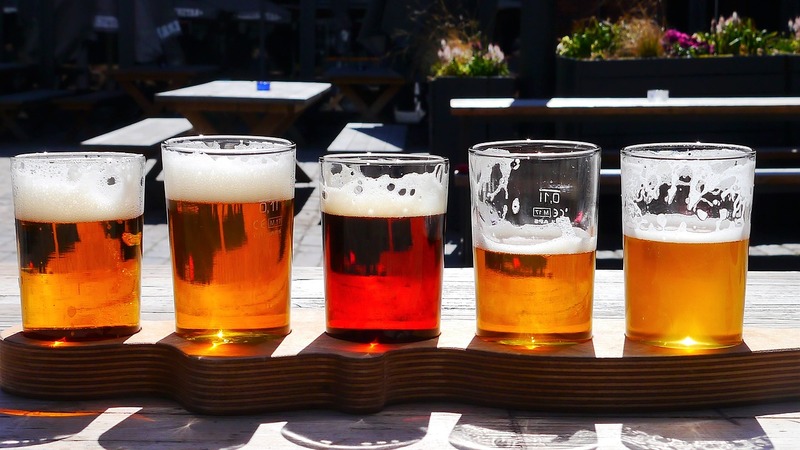 Let us take a look at five classic beer styles, sure to complement the many beach days and back yard barbecues ahead. Whether spending the day at the beach or simply working out in the garden, the first beer style to come to this author’s mind on a hot day is unquestionably Saison. Saison (from the French word “Season”), is a pale to copper, dry, thirst-quenching ale. It was historically brewed by farmers in the French-speaking province of Wallonia, Belgium to serve as a safe source of hydration for field workers. A favourite among craft brewers, the Saison grist is primarily comprised of Pilsner or Pale Ale malt, but often includes the edition of wheat, rye, oats, spelt, or other grains; a throwback to the days when this beer was brewed with whatever grains happened to be growing on the farm. Typically clocking in between 5% – 7% ABV, a Saison is a highly carbonated, moderately hopped beer, whose flavour is driven by the fruity esters (pear, apple, citrus) and spicy phenols (black pepper, grains of paradise) produced by the unique Saison yeast strains commonly used in these beers. These Saison yeast strains (often coupled with various wild yeast strains, aka “Brett”) are also capable of breaking down larger sugar molecules than your average brewer’s yeast, resulting in a dry, refreshing ale, which goes down a treat on a hot summer day. Fortunately, one does not need to travel to Belgium in order to get their hands on a world-class example of the style. A few notable Saisons brewed right here in New Zealand include McLeod’s “Turadh” Saison and Kainui Brew Co.’s “Summer Love” Saison. Sour beer has been all the rage in craft beer circles for a number of years now. These sour, dry, lighter-bodied beers can be paired perfectly with a beach chair and a sunny afternoon. And yet, the intensely acidic Lambics and Flanders Reds can be a bit much for some Palates, as they tend to be sippers more than quafers. Fortunately there are a few more-approachable alternatives that might be described as simply “tart” rather than outright sour. One such beer is the Gose (pronounced Goes-uh). Hailing from the German town of Goslar, these tart, salty (yes salty), wheat beers, are fermented with traditional brewer’s yeast as well as lactic acid producing bacteria, and are often spiced with coriander. This (only slightly detectable) salty flavour is due to the salty water of the Goslar River; the original source of brewing water used to produce these beers. The unique but pleasant salty/sweet balance of the Gose has proved quite popular here in New Zealand, with more than a few craft brewers now producing versions of their own; both in the traditional style, and with unique flavour additions such as fruit, dry-hops, hot peppers, and even smoke. A few standout Kiwi examples include Boneface’s “The Juice”, North End’s “Become the Ocean”, or for something unique try Deep Creek’s “Smoked Chilli? Gose”. One of the hottest beer-style trends at the moment is the explosion in popularity of what has been dubbed “Brut IPA”. In the wine-world we know the term “Brut” to refer to the driest of sparkling wine/champagne. IPA, of course, refers to India Pale Ale, which is without question the most popular craft beer style. And so it should be no surprise that inventive craft brewers are always on the lookout for new ways to reinvent the IPA. This new pale, ultra-dry IPA is the latest of these inventions. Traditional IPAs tend to be stronger-than-average beers, and as such, they often possess a fair degree of residual body and – at times – malt sweetness. While big, chewy beers like this may taste great, they don’t always inspire you to tear through a six-pack. As such, the trend has been to produce dryer and dryer IPAs by lowering the mash temp and occasionally adding sugar to the grist. The Brut IPA takes this one step further by using special enzymes in the brewing process, which help break down larger sugar molecules so that they can be more-completely consumed by brewer’s yeast. That, coupled with a (typically) simpler malt bill results in a pale, ultra-dry beer that still has all the hoppy goodness that IPA drinkers crave. So if you’re a hop-head seeking a more “poundable” IPA this summer season, grab yourself a Brut IPA during your next trip to the bottle shop. Urbanaut’s “Copacabana Brut IPA”, and 8 Wired’s “High Society Brut IPA” are both worth keeping an eye out for. Witbier (aka Wit, Witte, White Beer, or Bière Blanche) is a 400-year-old beer style that went extinct around the middle of the 20th century, only to be later revived by the Hoegaarden Brewery in Belgium. Since that time, it has steadily gained popularity precisely for its appeal as a “summer beer”. Typically comprised of about 50% barley and 50% wheat, this refreshing ale is brewed with a Belgian yeast strain and (often) includes the addition of coriander and orange peel. The result is a refreshing, elegant, delicious, fruity, wheat beer that is another great grab from the chilly bin at your next summer outing. If Hoegaarden isn’t your thing – or you’d just like to try something local – you might keep an eye out for Hallertau’s “Tangelo Belgian Witbier” or “Indie Wit”, a collaboration beer between Birkenhead and Sparks Brewing. No New Zealand summer beer list would be complete without a mention of “New Zealand Pilsner”. Despite the overwhelming popularity of New Zealand Draught in this country, it was the New Zealand Pilsner that recently became the first internationally recognized beer style by the BJCP (beer judge certification program), fanning the flames of its popularity both at home and abroad. New Zealand Pilsner’s tend to possess a balance similar to a Czech Pilsner, while exhibiting hop flavours and aromas that are distinctly Kiwi. Instead of the herbal/spicy/floral qualities of the Czech and German Noble Hops used in other examples of the style, a New Zealand Pilsner uses local varieties known for their tropical fruit flavours and aromas, such as Nelson Sauvin, Motueka, and Riwaka. If you’re simply looking for a good, classic Kiwi drop to get you through this heat wave, a New Zealand Pilsner is the beer for you. You can’t go wrong with Emerson’s “NZ Pilsner” (said to be the original example of the style), but other tasty examples include Liberty’s “Halo Pilsner”, Behemoth’s “Hopped Up On Pils”, and Kainui Brew Co’s “Postman Pilsner”.